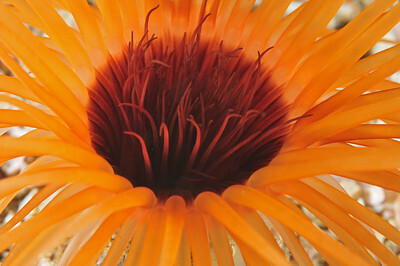 Artistic underwater photography can include use of color, texture, patterns, abstracts, and super macro. Developing an eye for artistic photography takes time. It helps to use other photographers' images for inspiration. 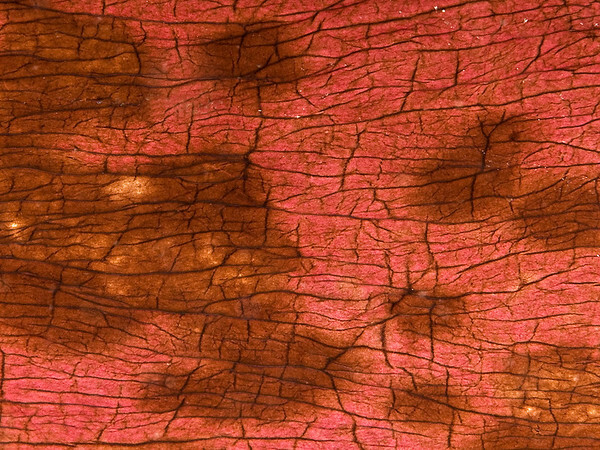 Start off looking for pattern, texture and abstracts in the macro and supermacro world, zooming your camera lens out, or using your longest macro lens for a two-dimensional feeling. Try to fill the frame with your subject. Color can be used to add a mood or feeling to a photograph. Blue can impart a sense of peace, calm, coolness, sadness, or quiet. Green gives a nature like feel. Yellow and orange show warmth. Red is always the most exciting color to photograph. 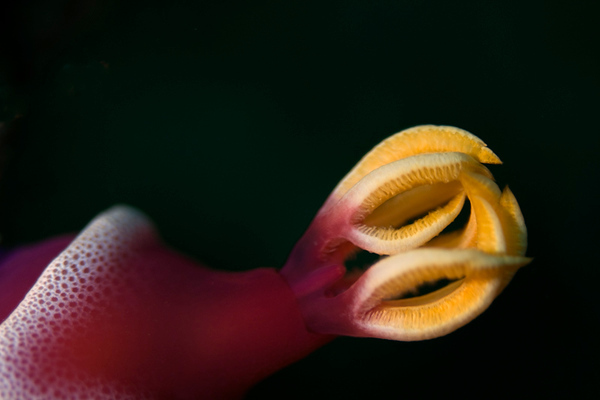 Red can be the nicest color to photograph underwater. 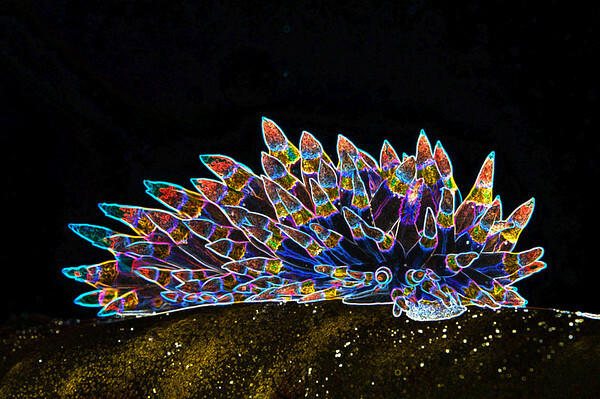 Beauty can be found in the gills of nudibranchs. This photo was shot at F2.8 for a soft touch, Canon 100mm lens. Photo by Michael Wicks. 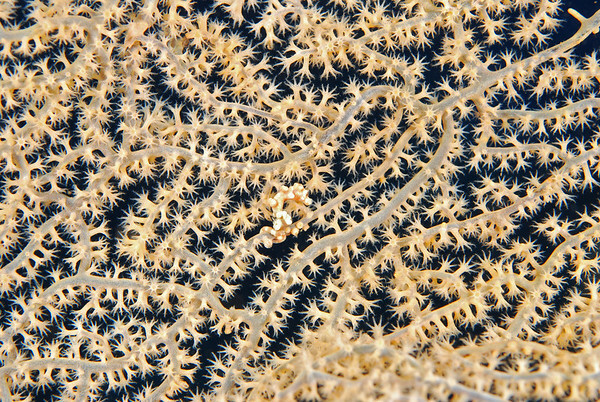 Sea fans can have great patterns. 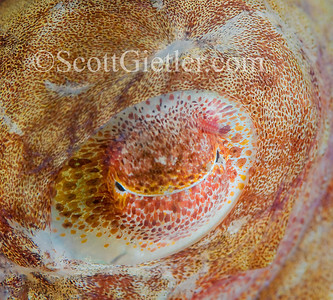 this one has a small pygmy seahorse in the center. You should fill the frame with the pattern. 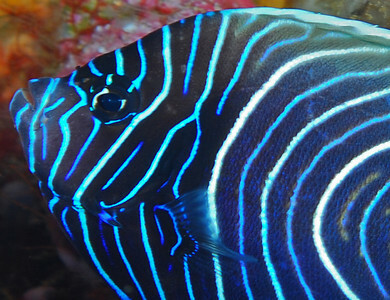 Fish can have nice patterns also. 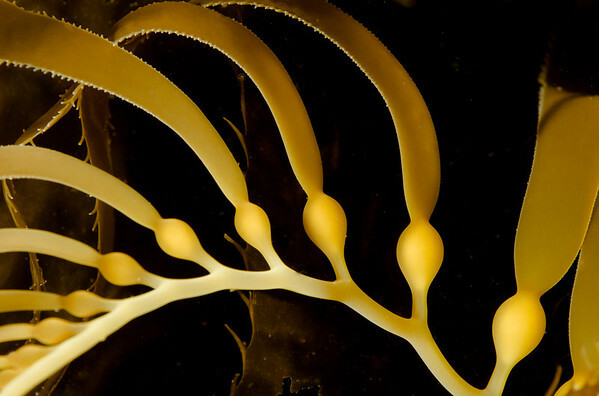 When photographing artistic photos of kelp, fill the frame with the kelp and try to capture patterns, lines and curves in 2 or 3 dimensions. 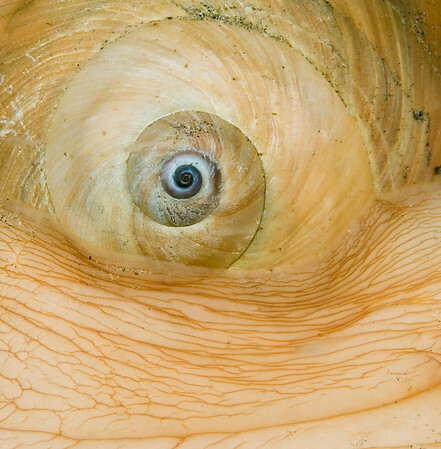 This is a closeup of a moon snail. Look for a pattern on a common subject, then fill the frame with your subject. Use a longer focal length for a compressed view, rather than a 3-d view. 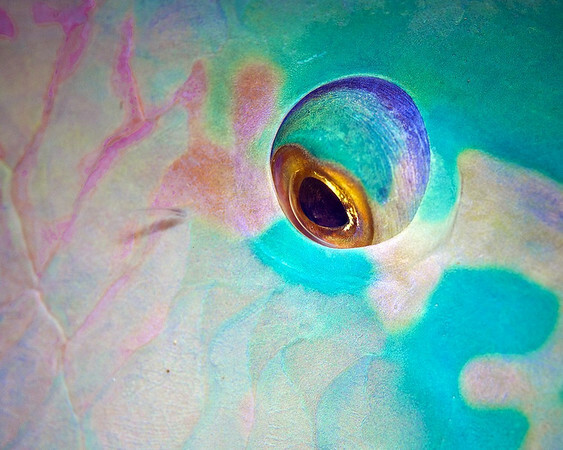 Here is an article highlighting Kevin Lee's amazing underwater texture photography. use sidelighting to bring out the texture. You should fill the frame with the pattern & texture for these kinds of shots. There's a very good gallery of abstract images here that you can also get ideas from. 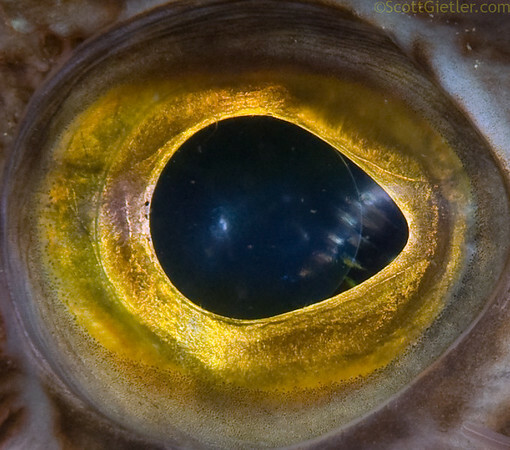 Fish eyes can make great artistic shots. 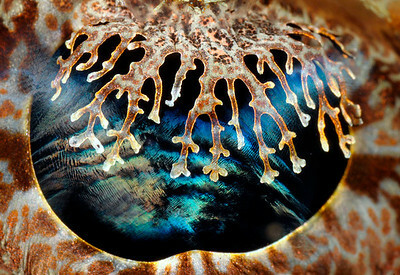 Eye of an octopus, uncropped. Los angeles, USA. 60mm + 1.4x teleconverter. A 105mm lens could have flattened the perspective even a little more. F22, 1/250th, ISO 250. I pulled the strobes close to the dome port so I could try direct front-lighting to lower contrast and maximize colors. 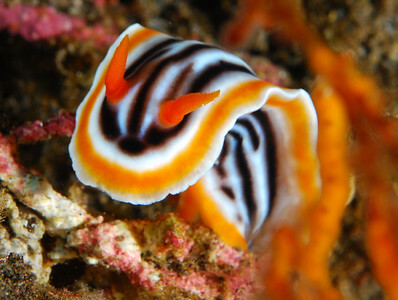 Selective colorization can be done underwater, or it can be done by converting your photo to black and white, but selectively coloring one area of the photo. 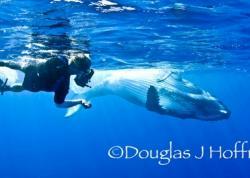 It can also be done by white-balancing a deep water ambient light shot that has dive lights in the photo. 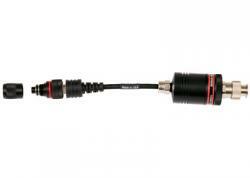 The dive lights will appear red. Here's an interesting example of selective colorization, without resorting to photoshop. Ok, it's more like selective lighting, but I like it. Photo by Cal Mero. Oly SP350, F3.2, 1/100th, ISO 100. 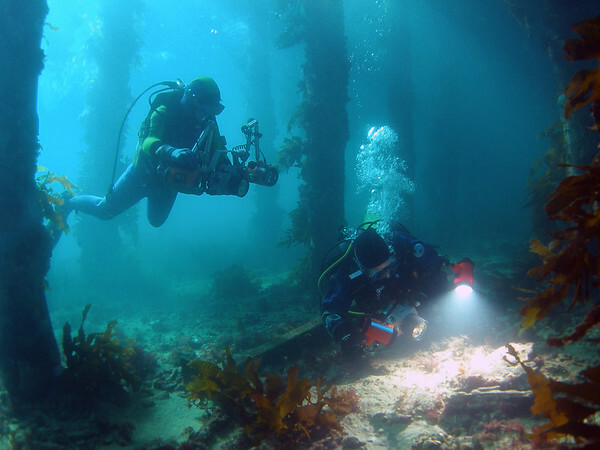 If this photo was white-balanced, the area under the dive light would turn red. 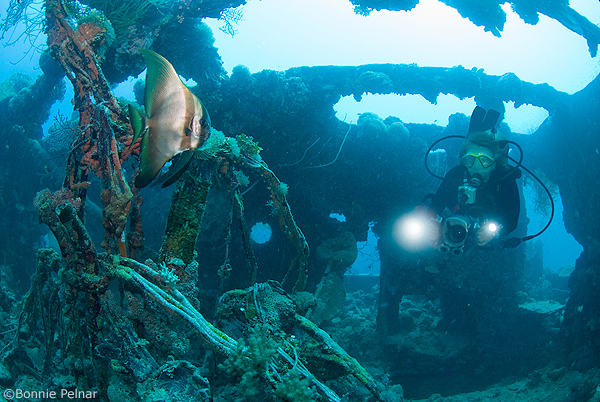 Wreck in truk lagoon, photo by Bonnie Pelnar. F6.3, 1/25th, ISO 100. D200 with a 10mm fisheye. 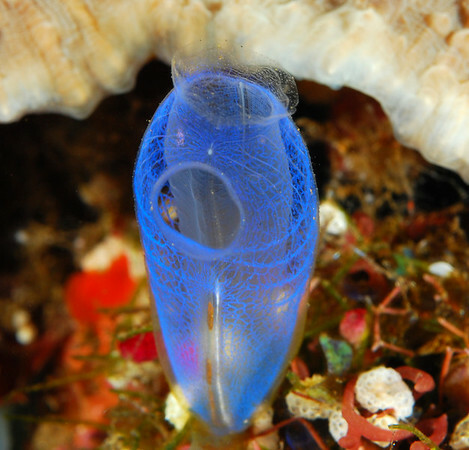 One area of the wreck was selectively colored by a strobe. Bonnie exposed the shot for ambient light, and turned the power of the strobe down. The area colored by the strobe was closest to the camera, more so that the other areas in the photo.